The theme for the 2018 AdFest is ‘Transform’. As usual a leading design firm is asked to create the graphics for the theme. For 2018, Kinetic Singapore stepped forward. The co-founder of Kinetic, Pann Lim, says they were inspired by the process of transforming one thing into another. “We chose to express this idea of ‘transformation’ in the form of a gradient, where the blurring of colours represents the melding and evolution of ideas,” explained Lim who is Jury President this year of Design Lotus and Print Craft Lotus at AdFest 2018. Jimmy Lam, President of AdFest, commented that never had AdFest had a brighter, vibrant or more distinctive identity. Behind the theme is the thought that how creativity can help businesses connect, succeed and remain relevant in the fast-changing digital economy. The creative ad industry is under pressure and that it adapts and changes. Equally important is creativity helps to humanise and personalise messages. The new logo depicts this by using a blurring of colours to represent the melding and evolution of ideas. 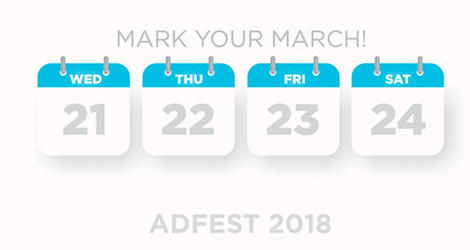 AdFest will be held on 21st to 24th March in Pattaya Thailand. You can now enter work by clicking here.